Settings of the Evening Canticles are central to the Anglican choral tradition. I regard Harvey’s kaleidoscopic Magnificat and Nunc dimittis (1978) as one of the two most significant contributions to this genre in the past 50 years—a set of canticles for the age of space travel! 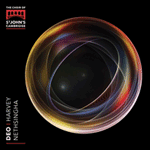 This work was written for Martin Neary and his choirs. When Harvey came to hear us sing the work at St John’s he asked for a note to be changed to enable the use of our organ’s Trompeta Real. The composer described the music to me in the following way: Magnificat paints Mary as a cosmic Mary, as a metaphysical Mary. Nunc dimittis, by contrast, is an extremely human image of an old man nearing death; the ‘t’s are expressive of brilliance and light. Magnificat is based on a cantus firmus, always the same series of notes, going round and round like a wheel. The wheel throws off sparks as it turns. It is like a nebula, a luminous or dark patch in the sky made by distant star-clusters, gas or dust. There is a rolling sense of the same idea moving on and on. The section He remembering his mercy has a sense of innocence, of childhood and of something timeless; the glissandi from speech to sung pitches are transitions between dreaming and wakefulness. The end of the Gloria, As it was in the beginning, has an urgency, a pleading quality regarding the future, a strong impulse to transform the cosmos. Although the vocal techniques are less complex than those employed in some of his secular compositions, the work nevertheless requires much that is not used in mainstream Anglican composition—whispering, glissandi, aleatoric writing, shouting, pitched speech, percussive effects using repeated consonants. We Anglican musicians tend to be conservative in our use of choir and instruments. Most repertoire is for choir a capella or with organ. Yet the psalmist urges us to make use of the lute and harp, of the trumpet and the clashing of cymbals: Let everything that hath breath praise the Lord. I feel sure that includes the techniques used here! Some contemporary music experts have considered Harvey’s church music to be of lesser importance than his instrumental works. I want to stress how imaginative, innovative and courageous Harvey was in pushing the boundaries of church music, without ever losing the intensity of spirituality which underpins all the great religious music from plainchant to Beethoven, from Byrd to Messiaen.